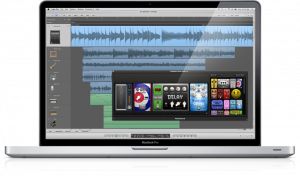 Apple on Tuesday released an update for its professional audio products, Logic Pro and MainStage. In addition to many bug fixes, the update also adds 64-bit support to both applications. Adding 64-bit support to Logic 9.1 and MainStage 2.1 effectively removes the memory limit imposed on 32-bit applications running under Mac OS X. When running the apps in 64-bit mode, users can take advantage of any memory left after allocating the system, plug-ins and other apps. One of the big questions is whether or not users will have the ability to use 32-bit plug-ins while working in 64-bit mode. Apple has looked after that with the Audio Unit 32-bit Bridge. Using this bridge, Apple made it possible for users to continue to use 32-bit plug-ins, while running Logic or MainStage in 64-bit mode. The only limitation is that the plug-ins themselves are still guided by 32-bit restrictions. To start Logic or MainStage in 64-bit mode, click on the app and choose “Get Info.” There is now a checkbox that says “Open in 32-bit mode” in the window to control how you would like to open the applications. The good news is that any project created under one mode can be opened under the other mode without any problems. There are several features that currently do not work under 64-bit mode in Logic Pro 9.1 including Firewire streaming of video; Digital Cinema Desktop; AAF import and export; EuCon control surface support; Automap of parameters with control surfaces; OMF import and export; Conversion to MP3; Recycle (REX) file support; ReWire support; Vienna Symphonic Library Tool; Logic Node processing; and AKAI format sample import. MainStage 2.1 has a number of features that don’t work under 64-bit mode including Recycle (REX) file support; ReWire support; Vienna Symphonic Library Tool; and AKAI format sample import. Adding 64-bit support support was not the only change in Logic 9.1. Apple also fixed almost 70 issues with the application in this update. MainStage 2.1 received similar treatment with over 40 issues fixed with the update. Both updates are available from Apple’s Web site or via the software update control panel in Mac OS X.